The New Year is always a time for neuralgia – sorry, I mean nostalgia – so I thought a few old photos might interest some of my readers. 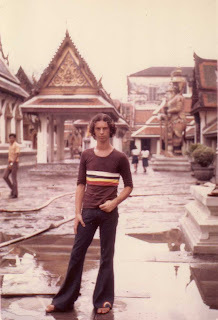 The first picture is of me in Bangkok in October 1973 where I went with the intention of becoming a monk. Please note the hair and the bell-bottoms. As it happens Thai Buddhism and the Thai monasteries I stayed in were not to my liking so I decided to move on to Burma. In Burma I stayed at Kabaye Pagoda in Rangoon and learned meditation under U Pannadipa, an experienced and skillful teacher and a pleasant and sagacious person. U. Pannadipa only died a few years ago. 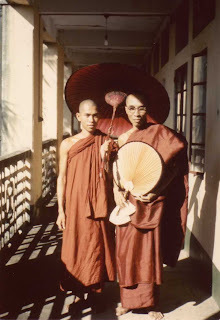 In those days foreigners were only able to stay in Burma for seven days so I went back and forwards between Bangkok and Rangoon several times learning meditation for seven days at a go in Rangoon. This is me and U Pannadipa just before I left r Rangoon for the last time heading for India. I ended up staying in India for several years, growing to love and hate the place, although I did and still do love it more than hate it. 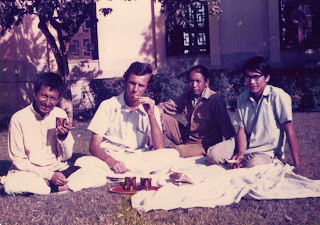 This is me and friends from Lahaul who I stayed with in Delhi during the summer of 1975. This is me during my first trip through the Himalayas. As you can see, living in India was starting to take its toll on my appearance. 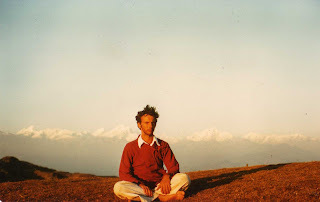 Tomorrow I will share with you some pictures of me as a young monk in India. 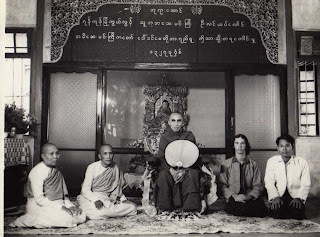 Bhante, the first photo was taken at the Royal Palace? Nothing seems to have changed since my visit a month ago. Guess you can say that some aspect of Thai Buddhism still remain as it was when you saw it 37 years ago. Bhante, you look like a real Indian in the last picture. Some things have changed. In those days you just walked in, today I am told you have to buy a very expensive ticket. I am not the 5th or 9th reincarnation of a great lama, I have not recived any empowerments or initiations, I am not the holder of any lineage, I am yet to attain any of the jhanas, I am not a widely respected teacher, I am not a stream enterer (at least I don't feel like one)and I do not have many disciples. Nontheless, you may find some of my observations and musings interesting. I have been a Buddhist monk for 32 years and am the spiritual advisor to the Buddha Dhamma Mandala Society in Singapore. Which Of The Four Am I? A great book for kids. Click on image to order. Have a question on Buddhism? A must if you are going to India. An insider's guide to Sri Lanka.